Prevent Pipes from Freezing | American Building Inspectors, Inc.
We are now well into Winter, so it’s important to keep an eye on the weather forecast and be prepared for cold, snow, and ice. When temperatures drop below freezing, follow our tips to prevent pipes from freezing. Avoid the inconvenience of frozen pipes, and the high cost that comes along with burst pipes by following our suggestions. If the temperature is not predicted to rise above freezing for a day or more, turn on all your faucets slightly so that they are dripping. Running even just a trickle water through the pipes reduces pressure and prevents pipes from bursting, even if the water inside the pipe still freezes. If that does happen and the dripping stops, keep the faucet open and point a space heater towards the pipe. Since the air is warmer inside your home than outside this time of year, keep your kitchen and bathroom cabinet doors open to expose them to more warm air. Again, running a space heater to introduce even more heat to the cabinet is a great extra precaution. Just remember to turn any heaters off when you leave the house. 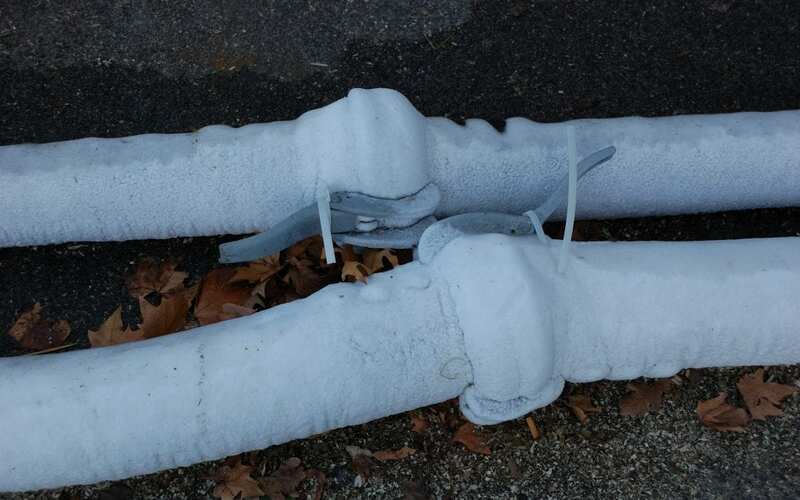 Pipes in an uninsulated area like the garage are most likely to freeze first. Make sure to keep your garage doors shut, especially at night. This will help keep the bitterly cold night air away from your pipes. Remove any garden hoses from your home’s outdoor faucet. An attached hose is likely to still have water inside which will freeze and increase the pressure on your plumbing, greatly increasing your chances of having burst pipes. It may seem tempting to turn the thermostat down at night to save a buck, but you want to keep your home at a consistently warm temperature to prevent pipes from freezing. If your goal in turning the heat down and bundling up at night is about cost, keep in mind that a burst pipe will cost you far more than your heating bill. American Building Inspectors wants you to enjoy your home, not run into problems with it. That’s why we provide home inspection services to the greater Philadelphia area. Contact us today to schedule an appointment.